Every now and then I need a good horror story. I just want to pick up a book and be whisked away to a dark place that no one likes to talk about. I don’t care if the horror is supernatural or a reality-based psychological freak out. I just, well…every so often, like to be scared. And who doesn’t? This book somewhat delivers on this. I want to give this a higher rating but I can’t. The idea of this book is a great one: a therapy support for survivors of traumatic events. No one really talks about the people who survive trauma, just the event itself or the inner workings of people who are guilty of doing it. 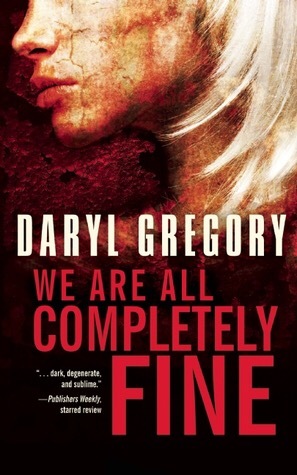 I also like that Daryl Gregory manages to discuss each character’s horrific experience without depressing us too much. The execution of this, however, is not so great. The point of view of each of the therapy group members shifted entirely too much, almost to where I couldn’t tell from one section to the next which person was talking. One moment it’s Jan, the group director, the next was Harrison, a group member, so on and so forth. I didn’t get the ending either. Way too abrupt and convoluted. Certain questions are never answered, too many plot strings left dangling. But maybe it’s just me. I understand that this is a novella, but I think this topic would have fit better into a novel format. I still feel like it’s unfinished, like Mr. Gregory only gave us half of a cup when the glass should have been full. You never really get to know the characters, because it’s time to move on to another perspective, another time, another place. It’s quick read for people who enjoy horror books, or people who have survived horrific events.